18 Heritage flower varieties discounted 10%. 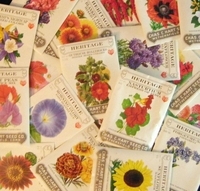 All the packets needed to grow an heirloom flower garden. These Varieties may be used as substitutes if the ones above are not available.